I know, I know… I haven’t posted in a couple of days. I have had issues I have been dealing with and some of my practices were put on the back burner. Which is just plain, silly. Truthfully it only takes a minute to do a practice. So there is really no excuse. The practice I will be doing today is from Dusty White’s free podcast at http://easytarotlessons.libsyn.com. I did the third lesson on learning reversals. The exercise/game played in this class was “And You Think You Had A Bad Day.” Pull three cards and use it to come up with some quick meanings for reverse of the cards chosen. And you thought you had a bad day… well just when I thought that the day wasn’t the worst day possible my worthless brother who thinks he knows everything proceeded to give me an hour lecture on what was wrong with my life. Urrrgh! Then the next door neighbor lady, who is a spends all day in a dirty nightgown sucking on cigarettes, knocked on my door and said I needed to do something about her dead lawn. What the heck? How is it my fault that her lawn is dead because she does nothing to take care of it!! 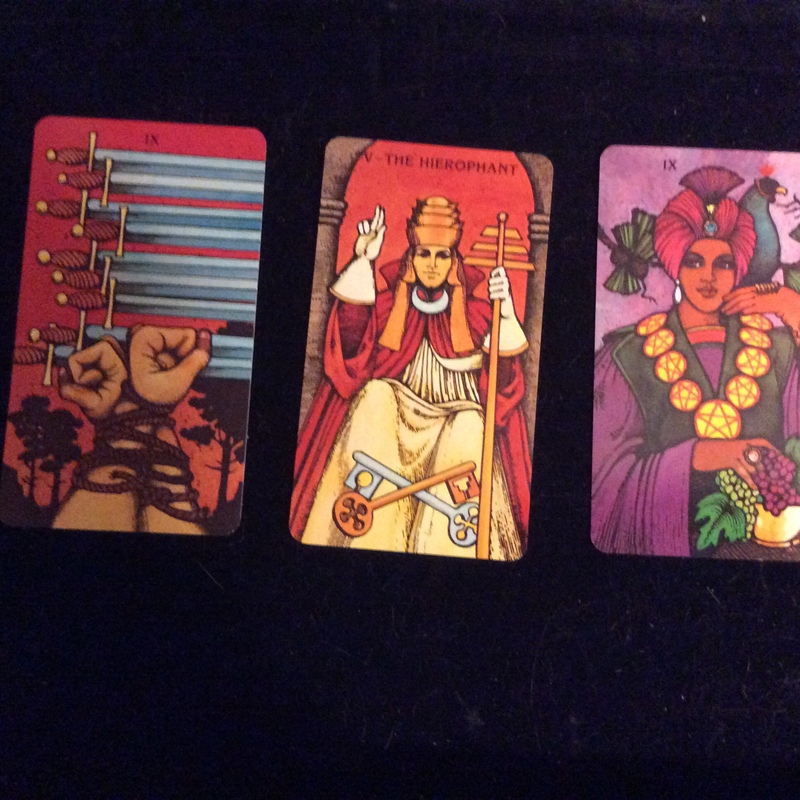 Today’s practice includes images from the Morgan-Greer tarot deck by artist Bill Greer. Distributed by U.S. Cards and Games. Available through U.S. Cards and Games or Amazon. If for any reason the images used in my tarot practice causes any problems due to copyright issues, please let me know right away and all images will be removed and ceased to be used. Posted by StarS in "And You Think You Had A Bad Day" Practice, Dusty White, practice, tarot, tarot cards, The Easiest Way to Learn Tarot - Ever!! Am I Flippin’? Yes, I am! I am now a Tarot Flipboard enthusiast.